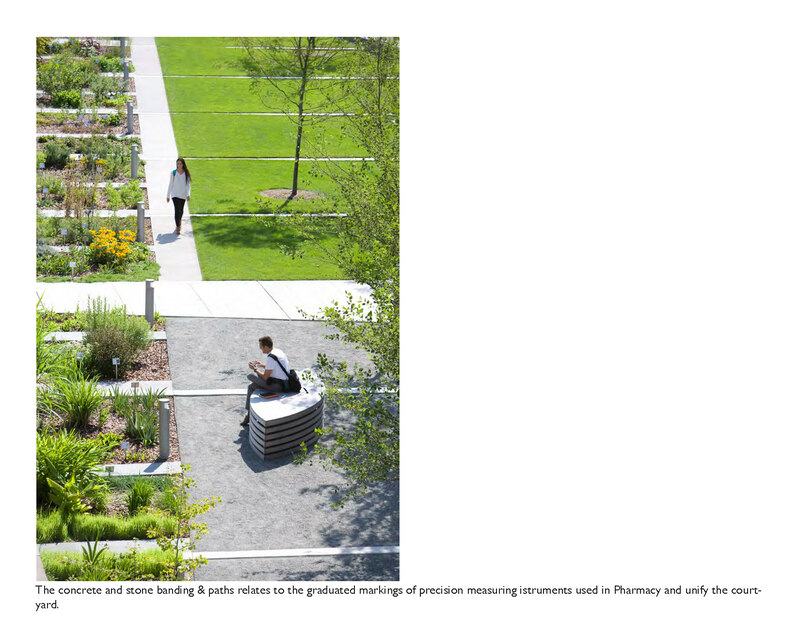 Project Statement: The Medicinal & Wellness Garden draws its inspiration from the fields of Pharmacy, Pharmacognosy and the geography and vernacular that is Rhode Island. 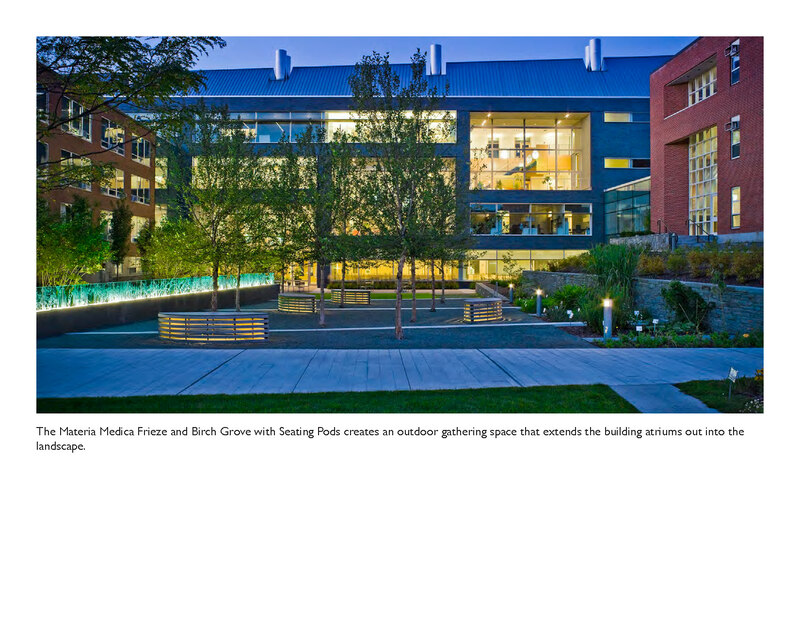 The courtyard, artwork and landscape are integrated as one, incorporating a major working medicinal plant laboratory into an open space that brings together faculty, staff students and the public. The landscape architects formed a team with two artists they have known for many years. The artists past work, while primarily indoor commissions, has had a strong basis in botany and plant physiology. The team has a mutual respect for each other’s work and thought that this would be an ideal project to collaborate on. The state received 150 submittals and short-listed 3 teams to do detailed design proposals which were then presented at the state House to the selection committee. This submittal represents the selected design which was completed in spring 2013. Site and context: The design competition site was designated as a 70’ x 235’ rectangle within the center of the newly formed courtyard. 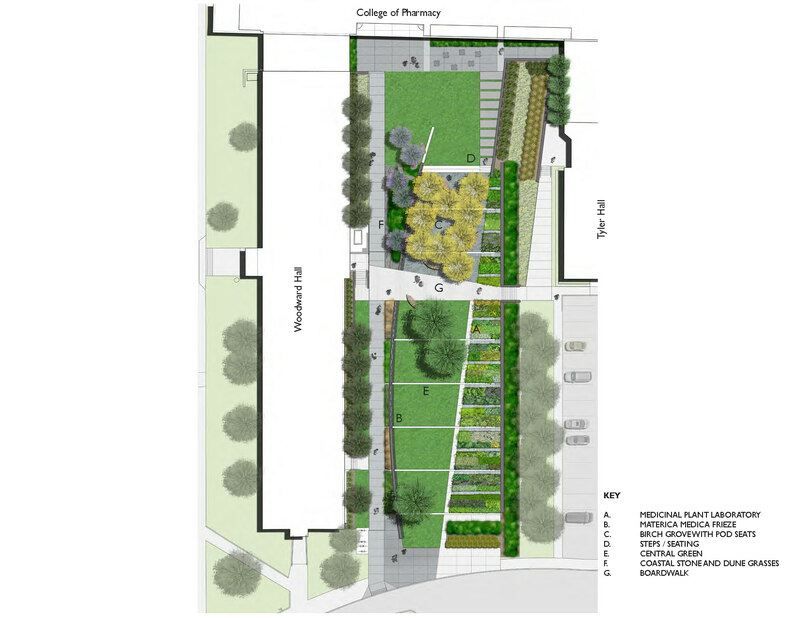 Through the design process it was acknowledged that it would need to expand to include the remaining portions of the courtyard in order to tie into the College of Pharmacy site and existing conditions. From East Alumni Avenue which forms the southern boundary of the site, there is 6’ of grade change as you move north to the new College of Pharmacy. The new building has four levels, all with expansive glass and exterior balconies overlooking the courtyard. The two flanking academic buildings are somewhat generic post-war brick buildings. Woodward Hall contains Geosciences, Plant Sciences & Entomology among other things, while Tyler Hall houses Computer Science, Digital Forensics Center and Computer Operations Center. 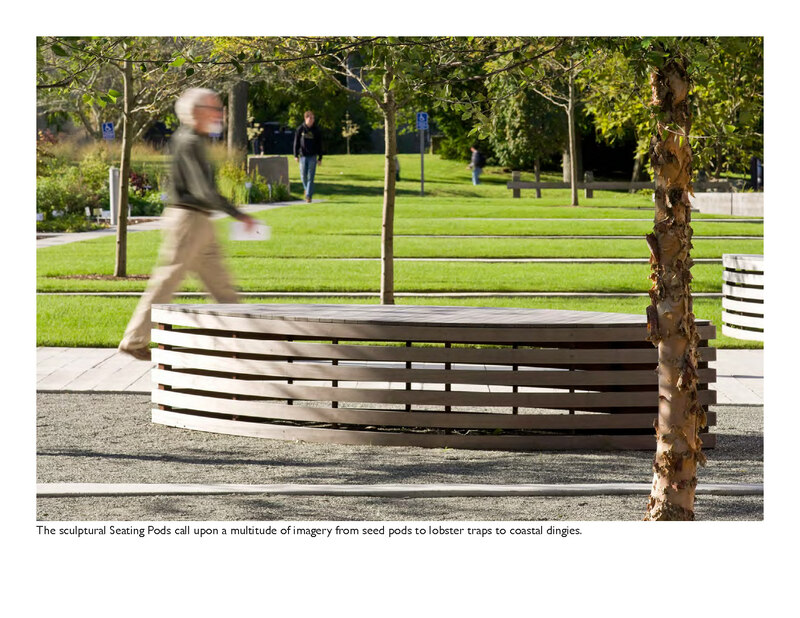 There were few programmatic requirements other than providing enough room for medicinal plants to be transplanted from the existing garden across campus, providing an east-west pedestrian path and providing a primary longitudinal walkway wide enough for emergency vehicles and service. Design Intent: The design team developed some strong goals for the project. This was an art commission and the team wanted the art and landscape to be developed as “one” unified piece, inseparable. 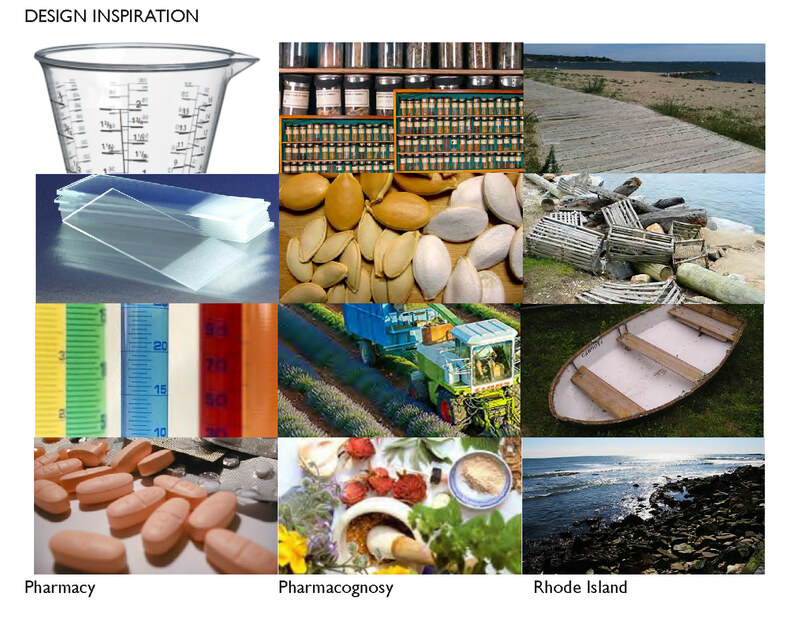 The solution should speak to the fields of Pharmacy and Pharmacognosy, but also to the context of Rhode Island and the strong influence of the coastal landscape. 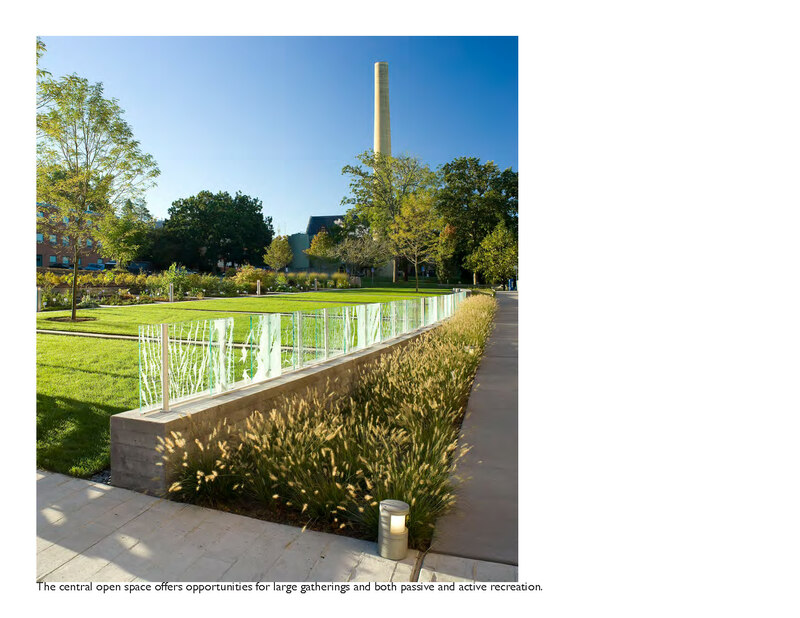 The landscape architects and artists met weekly during the schematic design phase with the landscape architects taking the lead on spatial organization, layout and grading and the artists considering appropriate imagery. The landscape architects researched Pharmacy, Pharmacognosy and the Rhode Island vernacular for inspiration that would guide the structure of the garden and the materials. The team began by looking at pharmacy, the macro environment pharmacognosy, the micro environment and the rhythm and patterns in nature. They began to see parallels and crossover between items such as the graduated cylinders used in the Pharmacy laboratory and the repetition /pattern of coastal boardwalks and dune fencing, between the seed pods of the medicinal plants and the dinghies strewn along the coast, and between the laboratory slides made from sand and the oceans ability to transform glass into sea glass. The artists discovered the long history of Materia Medica publications over the centuries that outlined knowledge regarding the therapeutic properties of natural substances used for healing. They began developing a concept for a Materia medica frieze that would span the length of the courtyard. The Plan: The site plan includes a progression of elements, from a spacious Central Green with a succession of textural medicinal plantings that spans the length of the garden, to a secluded sanctuary of birches, seating and steps. 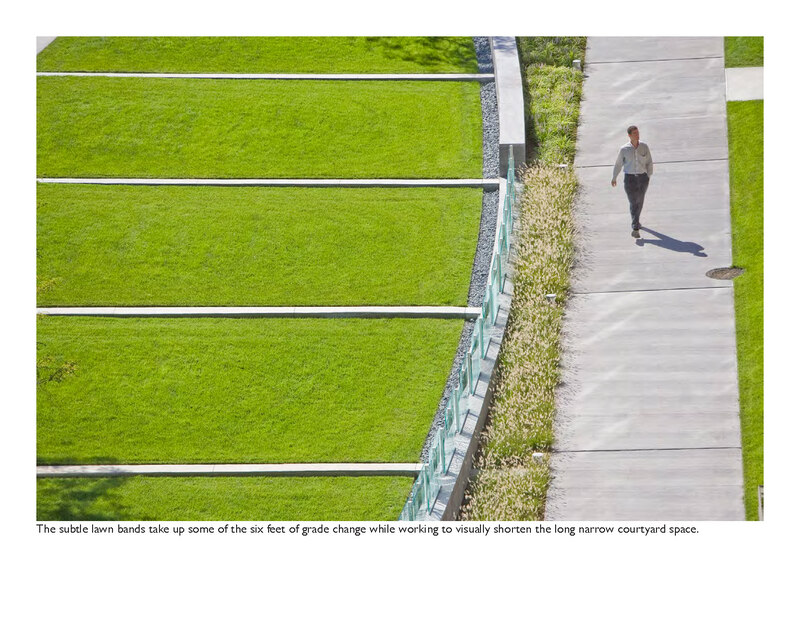 This open space acts as a mini-campus green allowing flex-space for classes, study, sitting and sunning. A drift of Honeylocust Trees provide scale and shade. Integral to the overall design of the Garden, the pattern of banding and walkways acts to visually tie the garden together and foreshorten the length. The medicinal plants are organized along the eastern garden edge to maximize western solar orientation against the low fieldstone retaining wall, creating a warm microclimate beneficial to the more temperate plants. The series of planting beds takes its shape from the ‘conical measures’ or laboratory glassware used for accurate measurement of liquids. The stone banding and garden paths relate to the graduated markings of these precision instruments and tie the garden together. The banding extends through the pharmacological laboratory of plantings, with groupings of plants organized in rows creating an overall medicinal tapestry. These rows of planting beds make a connection to the strong history of URI’s beginning as a State Agricultural School and the growing interest in the investigation and industry of medicinal plant farms. A sidewalk of concrete with a boardform texture connects with coastal references while providing east-west pedestrian circulation. On the north side of this sidewalk, native River Birch emerge from stone dust forming a shady grove and providing privacy from the upper floors of the architecture. Wood seating ‘Pods’ are scattered throughout the grove, borrowing materiality from the green wall lattice of the new building’s porches and extending it out into the landscape. These sculptural pods call upon a multitude of imagery while providing a practical place to sit and gather. 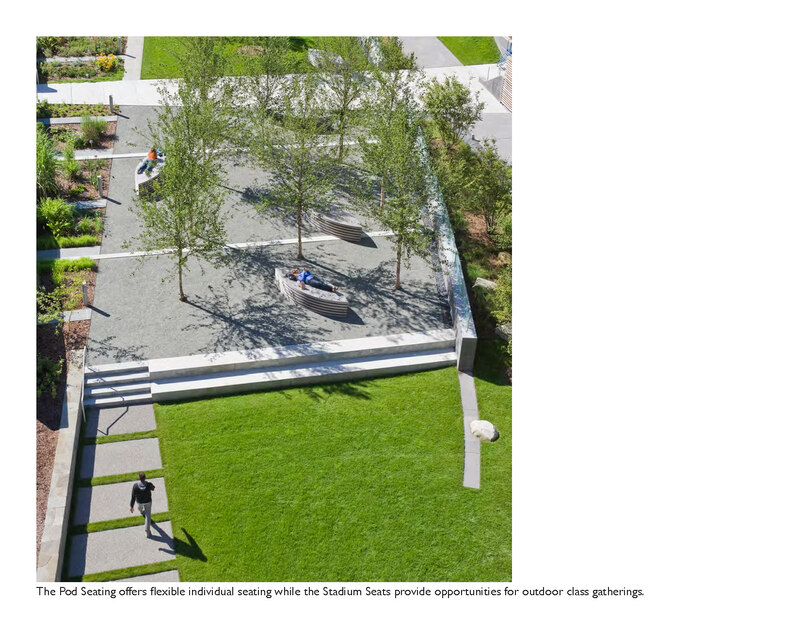 At the very north end of the garden, steps and seating steps provide classroom space and a transition from the Birch Grove to the lawn below. Materia Medica Frieze: A long arc wall begins as a seat wall at the southern end of the garden and grows in height as the adjacent grade descends. 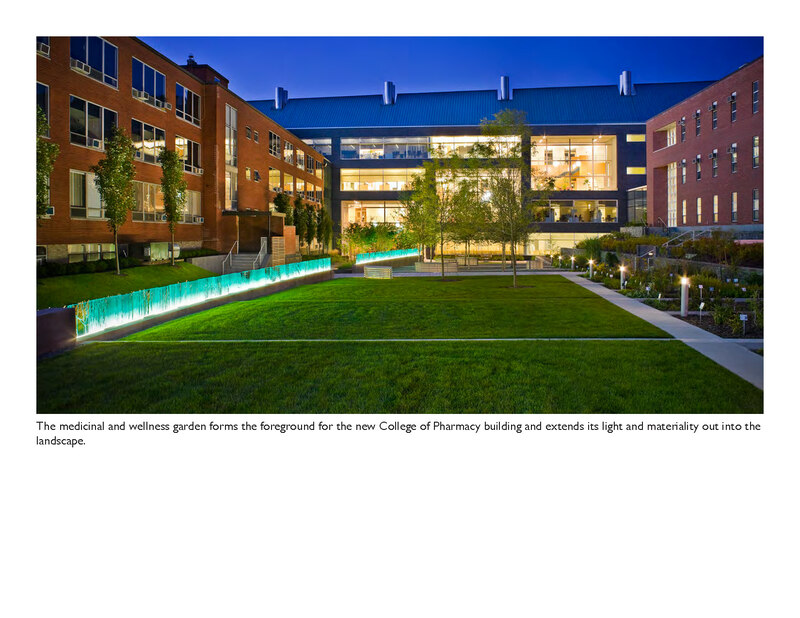 The wall guides visitors into the courtyard and leads them towards the College of Pharmacy building entrance. It is a contemporary gesture reflective of the edge conditions created by both Rhode Island’s seacoast and frequent stone walls dotting the countryside. The horizontal boardform pattern of the concrete wall accentuates the drop in courtyard elevation and becomes the plinth for the “Materia Medica Frieze” a sculpture of transparent panels. The frieze forms a scrim lending privacy to the garden from Woodward Hall and the main pedestrian walkway. The gentle curve of the wall embraces the garden while visually appearing to widen the space. On the east side of the wall a small ‘runnel’ collects surface runoff and channels it toward the northern edge of the garden. On the western side of the wall, native stone forms an abstraction of the Rhode Island coastline, with adjacent beds of native dune grasses. Emerging out of the wall, the Materia Medica frieze makes visible a poetic investigation of plant matter. 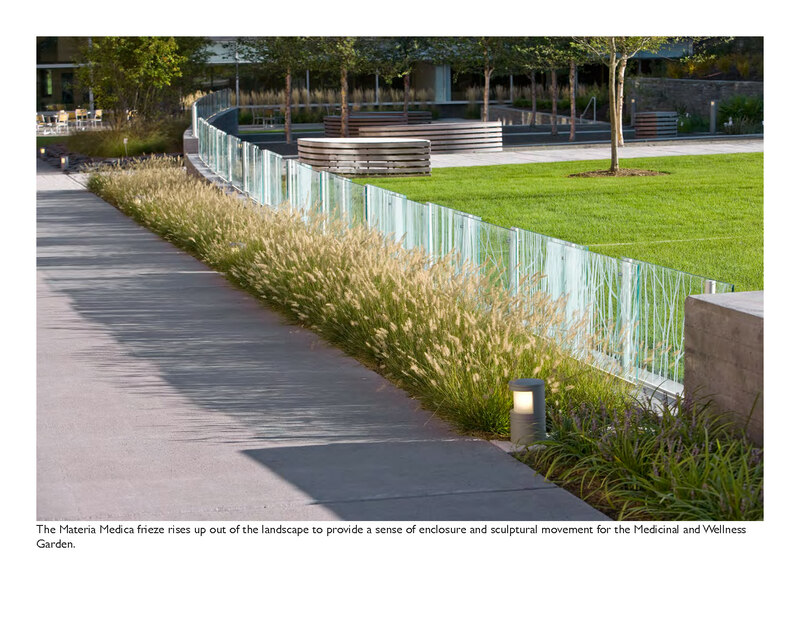 A progression of images and patterns illuminate the frieze which is made from fifty, one-half inch thick, two-foot by four-foot tempered glass panels fastened to aluminum posts. 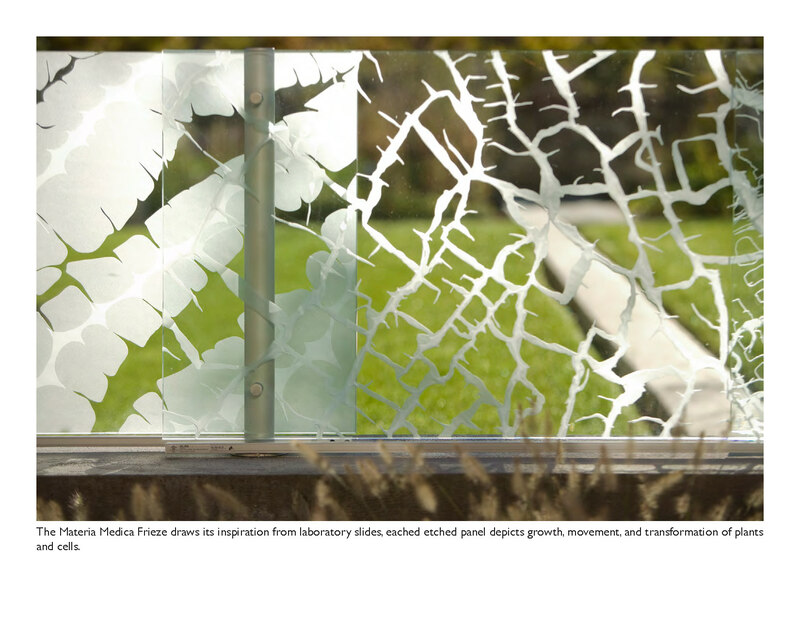 Drawing its physical inspiration from laboratory slides, each etched panel depicts the activity of growth, movement, and transformation of plants and cells. Like cellular activity viewed through a microscope, a multitude of imagery is seen overlapping, combining and diffusing from one transparent panel to the next. Throughout the length of the frieze, visualization is given to the dynamic interactions of cells and the energetic occurrences on both a plant and molecular level. The frieze abstractly depicts numerous biological processes, chemical reactions or other events that result in transformation. The panels are etched on both sides creating depth and shadow to the frieze. The panels gradually increase in overlap from north to south, cumulatively creating both a depth and intensity to the frieze. Through the continuous band of imagery, the grade descends, and the frieze gradually emerges as the focal point in the Garden. Linear LED lights evenly illuminate the panels from below, creating an inviting glow to the courtyard. Local Significance: The medicinal and wellness garden has become a favorite of both staff and students. The over 200 medicinal plants were transplanted by volunteers from the existing Heber W. Youngken Jr. Medicinal Plant Garden to their new location. The College of Pharmacy staff have taken on the courtyard maintenance in an effort to have control over how it is maintained. The design team has lectured to the URI Landscape Architecture students as well as the Studio Arts students, educating them on the importance of collaborative projects. Special Features: The initial RISCA budget for the core portion of the project was $480,000. As the project developed, another $482,930 was added to cover additional scope, engineering fees and escalation to cover delays caused by the main building project. Due to the unusual contractual requirements of this project, the design team had to act as the general contractor, hiring a landscape contractor and keeping track of materials and payments. Since this was technically a state art project it was not subject to union labor. Because it was surrounded by a large union job site for the Pharmacy building there were predictable challenges that our contractors had to deal with. In addition, the total project budget had to include professional fees for the design team and any consultants. This entry was posted in News on February 7, 2014 by rhodeislandasla.